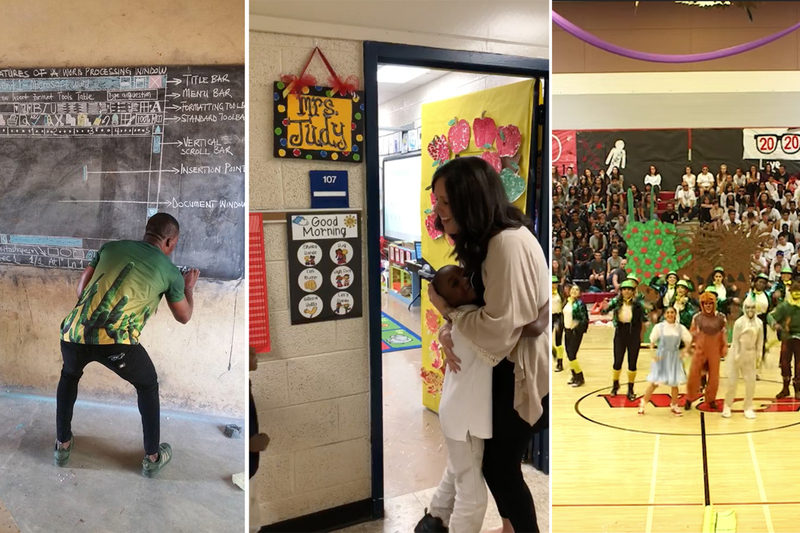 The Most Viral Teaching Moments Of 2018 Teachers used social media this year to let the world into their classrooms. What did we see? A lot of crying, hugging and learning. In 2018, teachers and students used social media to let the world in. Viral posts shared moments of joy, laughter and even anger. Educators responded to the news — and sometimes they made news. We've been gathering up the most notable of those school-related viral moments of the year — our roundup is below. On the third day of the year, Aaron Maybin, a former NFL linebacker who now teaches through an arts program, posted a video on Twitter of young students at Matthew A. Henson Elementary School in Baltimore. "What's the day been like for you guys today?" he asks. "Cold!" "Very very very very very very cold!" The video and Maybin's message, "This.Is.Unacceptable." got 164,000 views, and helped amplify media coverage about a lack of heat in the city's school buildings. Maybin tells NPR the video helped raise $90,000 to provide winter items for over 40 schools and local community organizations. A Baltimore native, he continues to post videos on his social media accounts to let people know what students' lives are like. "Often times we don't understand how truly wrong or unjust something is until we see it for ourselves, so I decided to show them what our kids were actually dealing with and see if they actually cared to do anything about it." A February video with 7.5 million views, posted by a teacher, shows students dancing on tables in the cafeteria at The Ron Clark Academy in Atlanta, after hearing that they'd be seeing the blockbuster action movie Black Panther as part of a day learning about African culture. This feel-good video became part of the general hype around Black Panther and its heroic depictions of African-Americans on film, as it was retweeted by the film's star, Chadwick Boseman, among others. On March 28, Laurissa Kovacs, an art teacher at Puterbaugh Middle School in McAlester, Okla., posted a picture of a broken classroom chair to explain why she was taking part in statewide walkouts. The post garnered 65,000 reactions and 85,000 shares, plus $44,000 in donations to date. The walkout ended with millions in new school funding from the state, plus many teachers running for office. "Teaching of ICT in Ghana's school is very funny," wrote Richard Appiah Akoto next to a picture of his classroom. Apparently, high school students in the West African country have to pass an Information and Communication Technology, or ICT, exam to graduate. But Akoto's school has no access to computers. So, his blackboard shows a version of Microsoft's Word — drawn by hand, in chalk. After the post made the rounds, Microsoft told the publication QZ that they would give the school at least one computer. But Akoto said they would need more like 50 to teach all the students adequately. As bruising and polarizing as the confirmation of Brett Kavanaugh to the U.S. Supreme Court was, it brought new attention in schools to teaching about consent. And in the aftermath of the hearings, videos of teachers like Liz Kleinrock, a teacher at Citizens of the World Charter School Silver Lake in Los Angeles, and Jamie Judy, a teacher at Len Lastinger Elementary in Tifton, Ga., struck a chord. Kleinrock had her third-graders brainstorm and create a chart showing when we need to ask for consent, what it sounds like, and what refusal sounds like. "Whenever I get frustrated about the state of our country, it inspires me to proactively teach my kids to DO BETTER," Kleinrock wrote in her Instagram post. The Facebook video of Judy shows her greeting her kindergartners at the door. Each points to a symbol on a chart to let her know what they want, like a hug, a high-five, or a little dance. "I do this good morning greeting with my students every day and they LOVE it!," Judy tells NPR. "They choose a way from the chart to greet me (hand shake, high five, elbow hello, dance, high five, or fist bump) or they can come up with their own (some do a foot hello, choose more than one, or just simply say "Good morning!")." It's a way to practice giving, and receiving, enthusiastic consent while recognizing that students may have different boundaries and preferences, even varying from day to day. Zelena Blancas, the first grade teacher who posted it, says the students repeat the ritual every day, with students taking turns being the greeter. "They go home knowing that they're loved in their classroom, that tomorrow's going to be a good day, and we are waiting for them." At the same time, "We know to respect that if you don't want to hug, if you don't feel comfortable, that's okay too!" Since the video garnered nearly 20 million views in a short time, "it's become a geography lesson." Blancas got out a map to show the kids where their well-wishers hail from: Argentina, France, Spain, as far away as Malaysia. The hashtag #BarabooShame trended on Twitter after a photo surfaced of high school students in Wisconsin giving what was widely interpreted to be a Nazi salute. The outrage intensified when the superintendent declared that the boys would not be punished. Meanwhile in Idaho, it was teachers who were accused of racism after dressing up as "Mexicans" and Trump's "Wall" for Halloween. In that case the superintendent apologized and placed the teachers on administrative leave after the pictures went viral. Trevor MacKenzie is an English teacher and instructional coach from Vancouver, British Columbia, who writes and speaks about the process of including student voice in teaching. In this Tweet and a further blog post he explained that he used a mini-conference during grading to help engage students in self-evaluation. I just spend the last two days writing my report cards WITH my students. I asked them about their strengths. I asked them to share a future learning goal. We looked at their body of work and we selected a grade. Together. Why haven't I been doing this my entire career? "I thought maybe he was somehow put in my class for me to help him ... it's the other way around I'm finding." Kindergarten students at Hickerson Elementary School in Tennessee surprised their janitor, Mr. James Anthony, who is hearing impaired, with a sign-language version of the birthday song. His reaction speaks louder than words. The state champion dance team of Walden Grove High School in Sahuarita, Ariz., creates homecoming performances that meld hit movies with hit songs and sharply synced moves. You kind of have to watch them, they'll make you feel happy to be alive in 2018. This year's offering is Harry Potter-themed and has 6.4 million views so far. Last year they did the Wizard of Oz.